In this article we shall endeavor to consider the various uses of the power rack and the best possible routines used to reap the most gains available from this training methodology. It would be foolish, indeed, to dismiss this training concept as merely a way of performing partial movements with a much heavier weight than could be otherwise handled within the usual method of exercise performance. If this were solely the case, then such training would be no more effective than other popular overload methods. But this is not the case with power rack training. Power rack training is a training philosophy entirely unto itself. One training factor which is usually overlooked by many trainees is the safety factor such training equipment affords you. When you train alone it is quite hard and sometimes downright dangerous to perform heavy limit attempts with the back squat and the bench press. With this in mind, it becomes almost impossible to force yourself to handle adequately heavy resistance for the chosen repetition scheme, so as to force the muscle fibers to respond with a growth and strength promoting effect. This means that for the most part, the weights used for the sets and repetitions will be somewhat lighter than otherwise possible would a spotter or the use of a power rack be made possible. In this respect, the power rack can be very useful when the trainee trains for the most part alone. 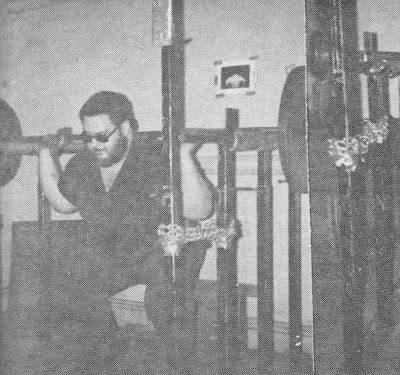 Concerning the safety factor of the power rack, we should also remember that even without using the training philosophy of rack work, the power rack, in itself, is a basic safety tool which will enable the lone trainee to handle very heavy weights in the various squatting and pressing movements with complete safety, though he is training alone. In this case, there are two methods of performance. First, would be to set the safety pins at the bottom or lowest position we would be going to in whatever movement we would be using. With the squat, we would place the safety pins at the lowest depth we would wish to reach when we descend into the lift. Then we would attach another set of pins as receiving hooks at the top of the movement and place the loaded bar on these hooks in order to begin our set. We would then do the movement in the usual manner, with the bottom pins acting as safety catches in case we can’t make the last repetition all the way to the top. There is another method of utilizing both the safety factor of the power rack and the power rack theory, even though in this case we would still not be utilizing the entire concept of power rack training to its fullest advantage or effectiveness. This method would consist of merely performing whatever movement we are interested in, with every repetition being performed within the power rack and each repetition performed from the bottom position on the rack. In this way you will be able to work each repetition of very set without incorporating any cheating movements which will not work for you all the time, plus you will have the additional safety factor which should not be overlooked, since it will enable you to work each and every set right into the ground! This ability to work each and every set to its limit is one of the true values of this rack training. Power rack training is one of the greatest examples of this type of training intensity which has become so popular today among the American bodybuilders and powerlifters, in general. By utilizing the power rack to incorporate this training concept we not only reap the benefit of the intensity factor of this type of exercise, but also we have the strictness of movement and the safety factor all rolled into one training method. The results from this kind of training must be experienced to really be appreciated. While on the topic of training intensity, we should also mention the ways in which power rack work will enable you to increase your training intensity and therefore decrease your necessary training time. It makes very little sense for us to spend three-quarters o our training time with weights which are too light to do our muscles any real good. The use of these light weights (below 70%) will develop a somewhat bloated appearance to the muscles and for the most part this appearance will give nothing to the development of useable, functional strength. If the trainee is somewhat overweight, then such lengthy workouts may be sometimes necessary to jar the muscular system into a new receptiveness to exercise and also, we must remember, in the case of the overweight trainee, any additional work will only enable him to burn up more in the way of stored energy (bodyfat) and while I, for one, need all the additional work I can get, I would not recommend this type of endurance training for the more normal trainee who is primarily seeking additional size and strength. For the development of muscular size, the intensity of the exercise program is of the upmost importance. It is not possible to work too hard but it is possible to work too much! This means that for the sole increase of muscular size, the hardness of each set is more important than the number of sets within any given workout. In the case of our would-be bulk fanatic, fewer sets, done to exhaustion with all possible repetitions being performed for each set, would be the way to go, in preference to more sets with lighter resistance. While on the topic of training intensity and its possible incorporation into a power rack program, we come to the problem of just how many ways there are to intensify our efforts while training on this piece of equipment. Just as there are various situations within a training program which will not necessitate both spontaneousness and creativity on the part of the trainee, so are there various methods of incorporating our ability to intensify our training efforts. Within the scope of training within the power rack, we have a few choices as to training methodology which should, with persistence and training time, enable us to greatly reduce our overall training volume while also increasing both our muscular size and strength due to the severity of the training application. One basic method of training intensity in the power rack is the Theory of Maximum Fatigue. Basically, this method consists of breaking each movement into three parts and performing our sets and repetitions within each of these three parts, from one set of pins to the other. The Maximum Fatigue Theory comes into play at the last repetition of the set. What we would do here is to push against the top pin for an additional six to eight seconds with all our might. Then we would lower the bar back to the starting point and then we would try to perform an extra repetition with this weight. Using this theory, each movement could be broken down into three positions with three sets done as just described, for each of the three positions. Nine sets done this way is quite a workload! Another method of training intensity could be called forced, partial repetitions within a power rack. What we would do in this case would be to use only one set of supporting pins, placed at the bottom position of our chosen movement. Now we could either begin our set from a deadstop at the bottom or we could take the bar in the usual way, from the top position, inside the rack. If our chosen repetition scheme is somewhere between five and seven repetitions, then we would perform these reps in the usual manner until we would come to the last repetition which we could complete on our own, and from here we would continue to perform as many partial movements as we could until no movement whatsoever would be possible. What we would be doing, in this situation, is forcing the muscle fibers within the sections of the muscle groups under stress to fully exhaust themselves to the point of momentary failure. With this in mind, it should become even more apparent that the power rack allows us to work much harder than any other method, with strength as our training goal. Also, we must remember that this piece of equipment allows us to fully and completely exhaust our muscle fiber’s supply of growth promoting fluids. When you train on power rack work for any real length of time, the poundages you will be capable of handling in a certain position will literally astound you! One training partner of mine is regularly performing lockout bench presses with close to 700 lbs. I can perform partial standing presses with no leg drive with a little over 600 and regularly handled over 1,000 in the quarter squat position when I was concentrating on improving my back squat poundage. It is not hard to parallel squat with 500 lbs. when you can quarter squat with over 1,000. Also, we should bear in mind that these heavy, partial repetition movements will most adequately strengthen our joints and ligaments which, in a round about way, will enable us to handle heavier exercise poundages in the usually performed style of training. This is one of the greatest benefits of properly applied power rack training – it develops within you an excess of usable strength! For increasing our poundages in the three power lifts, the power rack is downright indispensable. First of all, it allows us to work the lifts themselves in complete safety without the necessary use of spotters. Second, it forces us to perform each repetition of every set strictly and according to the rules of the competition. Also, through the use of either the Maximum Fatigue Theory or Forced Repetition Theory, we are enable to fully work each and every set with the most intense application possible. We are literally enabled to work ‘past the point of momentary failure.’ As a scheme to figure out how much in the way of sets and repetitions we should utilize for proper power lifting gains, I would advise somewhere between 3 and 5 sets of each of the three positions for each of the chosen movements we have decided to use, with the repetition scheme falling somewhere between 4 and 7 repetitions. This will enable us to handle some fairly heavy poundages in our training movements, thereby assuring that our gains will not be solely ‘bloated’ tissue, but more densely developed tissue. The end result would be a muscular development which would be capable of hoisting some really heavy poundages in the accepted Power Three. Since most powerlifters train each lift twice weekly, I would then advise you to work o the rack once per week or each lift, and once per week in the usual fashion using full range movements with the intensity on this second day falling between 70 and 80 percent of maximum capability. In this way you are assured that you will not lose any ability on the actual competitive performance style of the chosen lifts with the brunt of your workload falling on your power rack training one day each week. 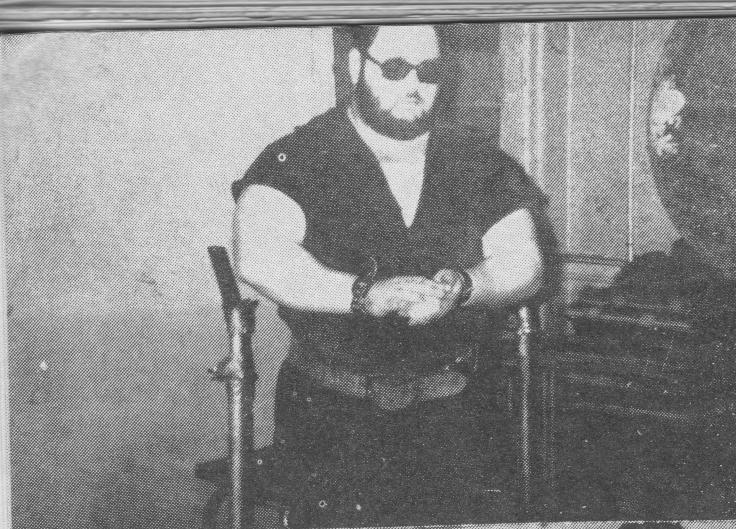 While on the subject of powerlifting we should also mention the ability of working our particular ‘sticking points’ on the rack with great success. What we would do would be to combine isotonic (movement) with isometric (no movement) at the point of least strength within the range of exercise performance of the competitive movements. What I would recommend is, after your usual rack work for any given exercise, place the bar just below the point where you are the weakest and try to move from this point all the weight you can budge for between 3 and 5 repetitions. By placing a second set of pins two inches above this ‘sticking point’ and by working within this range, we can also contract isometrically at the end of each set. With regular application of this principle we could eventually turn our sticking points into strong points within the range of the exercise movement. Needless to say, this type of training will eventually work for just about any interested and dedicated trainee. The main obstacle to overcome is the initial muscular weakness in this area, since this area is our point of lack of strength. However, we should persist past this initial period of physical adjustment, the additional strength gained through this system of training will astound you! For general training and the sole increase of muscular size we can afford to be somewhat more liberal in our choice of sets and repetitions since we are not attempting to channel our training into any particular lifting movement. In this case we incorporate more fully a general training methodology and power rack training, with the end result being a more densely packed physique – one that possesses both size and strength as well as shape and definition. In this type of training I would recommend a somewhat higher set and repetition scheme since our main goal would be to thoroughly work and congest the involved muscles with additional growth promoting blood as well as deeper fiber stimulation due to the severity of the pertaining exercise. For rapid increases in muscular size I would recommend a mixed repetition scheme somewhere between 6 and 8 with the forced partial repetitions being included at the end of each of these sets. We would not be working with ‘sticking point’ movements in this case, so we could afford to utilize more in the way of additional sets for each movement and the sections of the movements themselves. This additional work would thoroughly congest the involved muscles with growth promoting blood and the heavy partial movements performed at the end of each set would literally ‘tear’ into the muscle fibers in a way which simply must be felt and experienced to be appreciated. In the case or our size seeker, the amount of work and the duration of his training lies entirely within his will and desires. It is up to him to decide just when he has had enough. Within the scope of a four-day routine, we could utilize the power rack on two training days and the usual training methods on the other two. By combining both training methods we assure ourselves of a more complete muscular response. As I come to the end of this discussion, I am made all the more aware of the complexity and profoundness of this training method. To fully discuss this type of training would take a small book within itself. Since we do not have this much space for this topic, what I have tried to do is impress upon you the effectiveness of such training in hopes that you will be able to incorporate it into your personal training scheme so as to further your gains in both size and strength. Power rack training is one sure method of increasing your muscular size and strength. It will enable you to experiment with intensified methods of training while at the same time it will enable you to greatly decrease your training volume and workload, due to the intensity of the training methodology. In other words, you will be training so severely and intensely that your routines will have to be shortened somewhat. This will not only enable you to completely recuperate from past periods of overtraining with the conventional methods but will enable you to more completely develop yourself and your strength to the limit of your genetic potential. If I had to pick one piece of training equipment, besides a barbell, that I would consistently use, it would without a doubt be a power rack. I consider it that important, not only for its versatility and strengthening factors, but also for its ability to safely aid in gaining strength and size.